I’m writing this post on Thursday morning in an attempt to catch up on blog posts, get back into writing, and find my groove after a hectic two weeks of moving. As I write this, it’s pouring outside – it’s been raining for about 18 hours straight and doesn’t appear to be stopping anytime soon. We still haven’t turned our heat on, but the good news is I’m curled up in front of a roaring fire that my husband was nice enough to get going for us once we woke up and came downstairs. Armed with a cup of coffee and my ancient laptop, I’m ready to go! 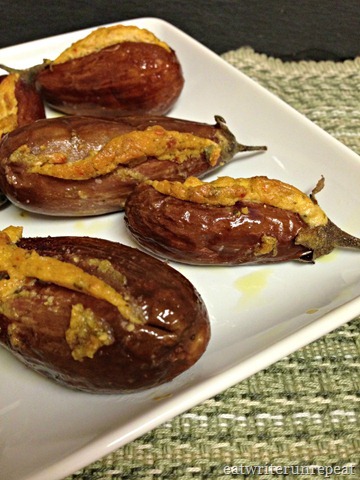 How about we start off with these baby eggplant stuffed with goat cheese and pesto? Tres adorable, no? Ok, so they maybe don’t look as pretty as they did before I baked them in the oven, but trust me – these babies? Might be my new favorite party appetizer! 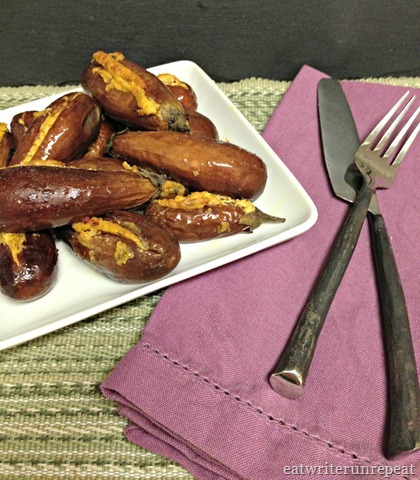 If you get really small eggplant you can even serve them as finger food! Although most of ours were a little too big for that, so I just chopped off the little top and then cut mine with a knife and fork. Still, it’s a different twist on the usual hors d’oeurves, am I right? This is what they looked like when I started out – aren’t they just too much? I was talking to a woman at the farmer’s market about them and she told me she loves to roast them and serve them on a sandwich with some basil, tomato and goat cheese. Because Kevin and I don’t eat bread a sandwich was out, but I loved the idea of goat cheese and after making stuffed chicken thighs a few nights prior, I figured why not stuff the baby eggplant as well? I wanted to do something more than just goat cheese so I rummaged through my refrigerator to see what I had on hand. And to what to my wandering eyes did appear, but some sundried tomato basil pesto! Perfect! I mixed about two tablespoons of my pesto into a 4 oz block of goat cheese and stuffed it into the baby eggplant before slathering them up with olive oil and sticking them in the oven to roast for about 30 minutes. Once they came out of them oven they were creamy, dreamy, roasted cheesy balls of goodness. Kevin couldn’t resist eating one directly off of the baking pan and promptly burned both his fingers and his mouth, but announced it completely worth it. After following suit (and yes, I burned my fingers and my mouth as well), I had to agree! And not only are they delicious but have I mentioned that they are absolutely adorable? Preheat oven to 375 degrees. 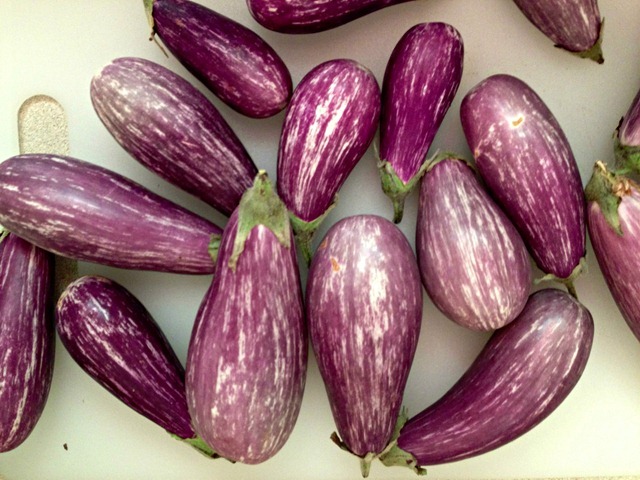 Cut a slit in each eggplant, deep enough to fill with goat cheese pesto filling but careful not to slice through the entire eggplant. Toss the eggplant with olive oil. In a bowl, combine goat cheese and pesto. 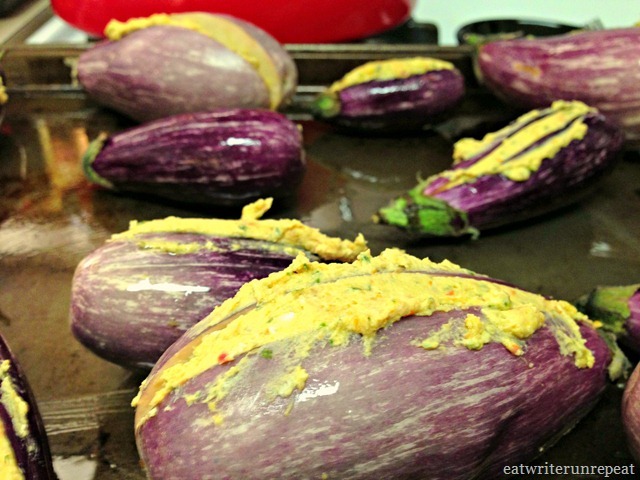 Fill the eggplant with the filling and lay on a baking sheet. 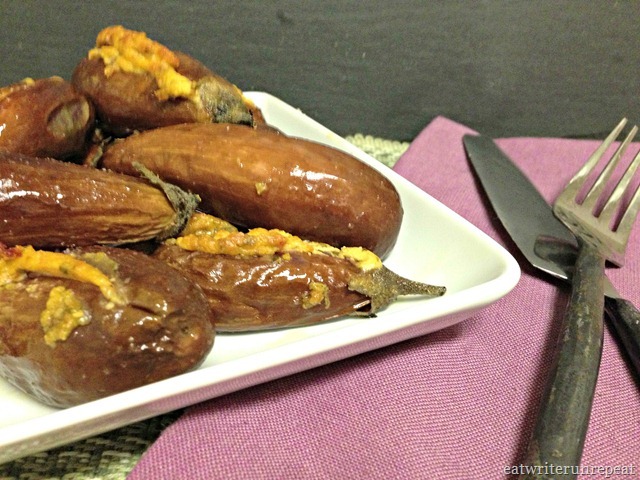 Roast in oven 30-40 minutes, until eggplant can be pierced easily with a knife. Serve immediately. Posted on 12 October 2013 1 October 2015 by BeePosted in Dressing/Condiments, Side Dishes, VeggiesTagged eggplant, goat cheese, pesto, side dish, stuffed eggplant, sun dried tomato, vegetables.